It’s not an entirely perfect Wrencher generator, as it has a lot of points to draw in the time available, resulting in a flickery Wrencher. (Update: take a look at the comments below, where he has posted an improved JSFiddle and advice on getting a better screen grab.) Thus the screen shot is an imperfect photograph rather than the usual grab to disk, for some reason the Rigol 1054z doesn’t allow the persistence to be turned up in X-Y mode so each grab only had a small part of the whole. But it draws a Wrencher on the screen, so we’re pretty impressed. The piece that inspired this Wrencher can be found here. If you think you can draw one with a faster refresh rate, get coding and put it in the comments. We can’t promise individual coverage for each effort though, we’re Hackaday rather than Yet-another-scope-Wrencher-aday. Several years ago, Iran used GPS spoofing to ‘land’ an RQ-170 Sentinel drone operated by the US military. Why is this interesting now? Because this week Pokemon GO was released. It’s a mobile, augmented-reality game that forces you to walk around your neighborhood to catch Pokemon. Apparently you can capture a Mewtwo if you make it to Area 51, Groudon near any volcano, and Deoxys is aboard the International Space Station. In the next week or two, someone will figure out how to spoof the GPS location on a phone to catch rare and legendary Pokemon. This will happen. If you ride a bicycle, you have a hand pump somewhere around. Those hand pumps get pretty tiring. Here’s a much better solution. It’s a pneumatic air pump. It will inflate your bike tire with the power of compressed air. But that’s not all… this device will also inflate basketballs, soccer balls, and footballs, all with a simple and easy to use air compressor. The Hackaday logo was one of the first things on Thingiverse, but surprisingly there aren’t many jolly wrenchers plastered onto 3D prints. To fix this glaring oversight by everyone, [Tom] whipped up the Hackaday logo in OpenSCAD. This week, Popular Mechanics published cutaway diagrams of ships that will be seen in Star Trek: Beyond, released later this month. This is your cue for spoilers for the remainder of this paragraph. The USS Franklin looks suspiciously like – and was likely built after – the NX-01, the titular ship of Star Trek: Enterprise. The Abrams-verse Franklin was the first Warp 4 ship, yet the prime universe NX-01 was the first Warp 5 ship, with previous ships having trouble reaching Warp 2. We must now consider the Abrams-verse Trek is not a parallel universe to prime-universe Trek and should therefore be considered a completely separate canon (yes, even the destruction of Vulcan. If you see the new Star Trek movie, the NX-01 launched in 2151, and your suggested viewing beforehand is ST:ENT, S02E24, First Flight. The Mechaduino is a Hackaday Prize entry that turns steppers into closed-loop servos. It’s a phenomenal idea, and now it’s a Kickstarter. Walk into a dollar store, and you’ll find stupid solar powered electronic flower pots. They’re bits of plastic that shake a plastic flower back and forth when placed in the sun. They’re selling millions, and I have no idea why. [Scott] put a jolly wrencher on one of these flower pots. Really, this is just an exercise in 3D printing, but [Scott] printed the jolly wrencher. We don’t see a lot of that, due to how difficult it is to render the wrencher in OpenSCAD. In just a few hours, Juno will perform an insertion burn around Jupiter. Does this mean pretty pictures? Not quite yet. This is the closest a spacecraft has ever gotten to Jupiter, and over thirty or forty orbits, Juno will fly between Jupiter’s massive radiation belts. Here’s the NASA trailer. It looks like Brexit has caught up to Mouser. 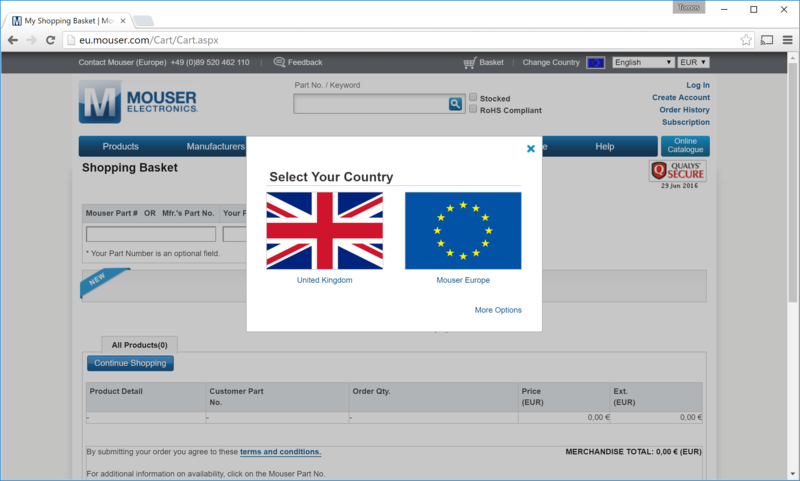 Here’s their country select dialog for eu.mouser.com. Thanks [Tom] for the screencap. The Hackaday Store Lives Again! Once upon a time there was a store where you could find the most amazing Hackaday shirts and other swag. If you managed to get one of the rare Jolly Wrencher adorned shirts back then, it’s probably about worn out by now. Prepare to rejoice, Hackaday has a completely new store packed with T-shirts, tools, and stuff to help you fill up those waking hours with hardware hacking goodness. We’ve had a little fun over the last couple of days with posts that hint (maybe a bit too subtly?) that this was coming. We always try to have a little bit of fun for those of you who are really paying attention. Now we’re wondering who will be the first to implement the one-time pad as a dedicated piece of hardware… project ideas need to come from somewhere, right? Take a look around the general store and you’ll see this time we have more than just stuff you wear. Hackers need tools and we’ve selected a small but inspiring group of must-have’s. The kits and toys we’ve selected are surely a rabbit hole of personal challenges and evolving hacks for you. And the best part is that these choices are one more way for us to promote the virtue of Open Design (it is the way). The only question now is what other open hardware do you want to see added to those ranks? Check it out, I made something really geeky for Maker Faire. If you’re going to be in San Mateo this weekend for Maker Faire Bay Area, watch for the floating Skull and Wrenches. I won’t be alone, and my compatriots and I will be loaded down with stuff to give away to those who ask for it. If you are hell-bent on finding us, just check this Twitter list as we’ll frequently be tweeting our locations and exploits.